Mirach 40 (M-40) is a re-usable aerial target system. The M-40 can simulate aircraft and missiles, as well as radar, infrared and visual threats. Mirach 40 (M-40) is a re-usable integrated aerial target system developed by Leonardo to support the training requirement of the armed forces worldwide. The remotely piloted aerial system (RPAS) has the ability to mimic a range of aerial threat and targets. The M-40 target system was launched into the market during the 2017 Paris Air Show held in June. The first flight tests of the Mirach 40 aerial target vehicle were successfully conducted at the Poligono Interforze Salto di Quirra Range, Sardinia, in early 2015. The M-40 is suitable for a range of training missions, including ground-based air defence (GBAD) artillery training and simulation of aerial targets conducted by the navy and air force training units. The target system can simulate a range of aircraft and missiles, as well as radar, infrared (IR) and visual threats. The capability of mimicking multiple threats enables the trainees to engage the reusable M-40 in realistic situations, while providing them with necessary skills to use various weapon systems in the battlespace. The M-40 target system is made of commercial components and was developed in-house by Leonardo. 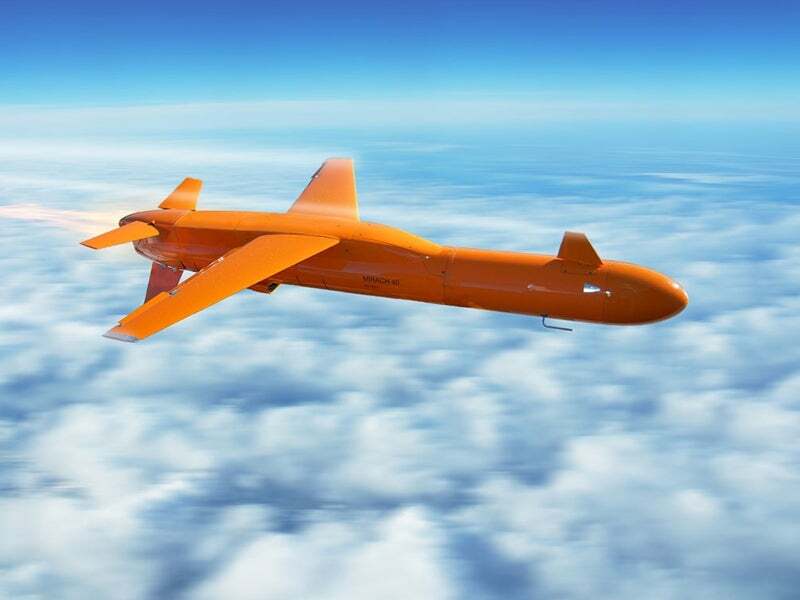 It is designed to offer medium-to-high performance at low cost when compared with other similar entry-level target drones. The target system retains the flight capabilities of the proven Mirach 100/5. Critical features such as a low-altitude sea-capability and the capacity to perform high-G manoeuvres enable the M-40 to outperform comparatively priced systems. The M-40 target system has a length of 2.5m, wingspan of 1.5m and fuselage diameter of 0.2m. Its maximum payload capacity and maximum take-off weight (MTOW) are 15kg and 70kg respectively. The target system can accommodate a range of mission payloads inside the fuselage and under the wings, including active and passive radar cross section (RCS) augmenters, IR augmenters, smoke generators, IR and chaff dispenser, and MDI radar. The flexibility to carry multiple payloads makes the M-40 an ideal solution to suit the most complex engagement scenarios in training, weapons system tests and evaluation. The M-40 is launched via a pneumatic catapult replacing the expensive and functionally critical pyrotechnical boosters. The catapult launch method increases mission reliability and safety while reducing the environmental and logistics footprint. The system can fly at operational altitudes ranging between 5,000m and more than 8,000m, and perform very-low-altitude sea-skimming flights, formation flights, and three-dimensional g-controlled manoeuvres. The target drone can be recovered either on ground or sea. The turnaround time required for recovery on ground is less than one hour, while sea recovery takes less than three hours. The M-40 system is powered by a single commercial, multi-fuel engine providing refined aerodynamic profile, allowing the drone to fly at higher speeds than most twin-engine platforms. The single-engine propulsion system also minimises maintenance requirements and enables quick and easy deployment even at remote training ranges. The M-40 system is controlled by the Mirach common ground control station, which allows mission planning and reassignment of tasks during operations. The control station also provides rehearsal and playback options to support operators training. The fully automated pre-flight test procedure further enhances mission reliability and reduces the operator workload and personnel training requirements. It also avoids the risk of human error probability to achieve the highest possible success rate. The M-40 target drone has a maximum speed exceeding 200m/s and can reach a maximum operating altitude of 8,000m. It can endure airborne for more than 60 minutes. This project forms part of our recent analysis and forecasts of the Global Missiles and Missile Defence Systems market available from our business information platform Strategic Defence Intelligence. For more information, click here or contact us: EMEA: +44 20 7936 6783; Americas: +1 415 439 4914; Asia Pacific: +61 2 9947 9709 or via email.